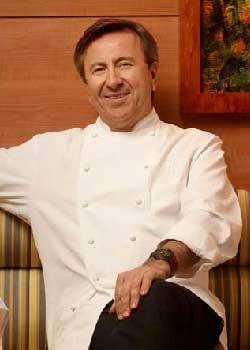 Daniel Boulud was born in France on 25th March, 1955. He was raised on his family's farm near Lyon, where he grew up surrounded by the rhythms of the seasons, the wonders of produce fresh from the fields, and of course, his grandmother's inspiring home cooking. After being nominated as a candidate for best cooking apprentice in France, Daniel went on to train under renowned Chefs including Roger Vergé, Georges Blanc and Michel Guérard. Following two years in Copenhagen where Daniel worked as a Chef in some of the city's finest kitchens, he made his way to the United States. His first position there was as Chef to The European Commission in Washington DC. Next, Daniel opened the Polo Lounge at The Westbury Hotel and later Le Régence at the Hotel Plaza Athenée in New York City. From 1986 to 1992, Daniel served as Executive Chef at New York's Le Cirque. During his tenure there, the restaurant was regularly chosen as one of the most highly rated in the country. In 1993, Daniel Boulud opened his own much-heralded restaurant DANIEL on Manhattan's Upper East Side. Here his inspiration remained the seasonal ingredients drawn from the best local purveyors. In just a year after opening, the restaurant was rated "one of the ten best restaurants in the world" by the International Herald Tribune. In September 1998 Daniel Boulud opened Café Boulud, named for the gathering place his great grandparents tended on their farm outside Lyon at the turn of the century. The contemporary Café Boulud is a French restaurant with an international accent welcoming Manhattan's café society to a spot with the cosmopolitan chic of a Parisian rendez-vous. In December of the same year the chef-restaurateur relocated DANIEL to its new Venetian renaissance inspired setting in the former Mayfair Hotel on Park Avenue and 65th Street. Since the restaurant's re-opening, Daniel Boulud has been named 'Chef of the Year' by Bon Appétit Magazine and the restaurant has received Gourmet Magazine's coveted 'Top Table' award. On March 14, 2001 the New York Times awarded DANIEL a coveted four-stars, while in the fall of 2003, DANIEL received both Wine Spectator's 'Grand Award' and New York City's top ratings for cuisine, service and decor in the Zagat Survey. In June 2001 the Chef opened DB Bistro Moderne in the City Club Hotel on West 44th Street. "DB" is a casual and contemporary restaurant in the heart of midtown, just steps from the theater district. Here, Daniel Boulud's latest menu offers updated bistro cooking rooted in French tradition. The chef opened a second Café Boulud in July 2003 at Palm Beach's legendary Brazilian Court hotel. The menu parallels that of its sister restaurant in Manhattan. The new restaurant accommodates 130 guests, offers a lounge and bar as well as two elegant private dining rooms. Daniel's other endeavors include Feast & Fêtes, the exclusive catering department of DANIEL and his 'Private Stock' line of Caspian caviar and smoked Scottish salmon offered via direct mail. In September 2003 Daniel will launch his own line of professional quality kitchenware, aptly called Daniel Boulud Kitchen (DBK). The first item to arrive on store shelves will be DBK knives and enameled cast iron cookware. Daniel was one of the founding partners of Payard Patisserie & Bistro and sold his interest in the business to François Payard in September 2000. Daniel Boulud is one of seven renowned chefs whose recipes are featured in the FiveLeaf line of foods prepared using a technique called 'sous-vide'. In this special process fresh ingredients are slowly cooked and flash frozen to insure optimal quality. The cooking technique allows ingredients' juices and flavors to blend together as if they had just been prepared. Serving-size portions of FiveLeaf dishes are distributed by Omaha steaks and are available at www.fiveleaf.com (866) 348-3532*. * This is a USA telephone number. Elle Décor magazine bi-monthly column: Daniel's Dish"
1969-72 Apprentice "Nandron" in Lyon, France. 1973-74 First Cook "La Mère Blanc", Vonnas, France. 1974-76 First Cook then Chef de Partie "Le Moulin de Mougins", Mougins, France. 1976-78 Sous-Chef "The Plaza Hotel", Copenhagen, Denmark. 1977 Chef de Partie "Les Prés d'Eugénie", Eugénie-les-Bains, France. 1980 Chef "Les Etoiles", Copenhagen, Denmark. 1982-84 Chef-Adjoint Westbury Hotel, New York City. 1997-00 Co-Owner "Payard Patisserie & Bistro", New York City. DANIEL offers a dining experience that awakens all the senses: the elegant ambiance, gracious service, delectable food and wine that epitomize "la grande restauration Française" in the heart of Manhattan's Upper East Side. Chef Daniel Boulud's renowned seasonal French cuisine is served in a beautiful setting reminiscent of a Venetian renaissance palazzo. Signature specialties include Creamy Oyster Velouté with Lemongrass and Caviar, Roasted Squab stuffed with Foie Gras and Morels, and a Chocolate Bombe with a Passion Fruit Crème Brûlée Center accompanied by rare world class vintages. DANIEL also offers the Bellecour Room for private entertaining as well as a warm and welcoming Bar and Lounge where guests enjoy a menu of light seasonal dishes, wines by the glass and house cocktails from 5 pm to midnight. DANIEL is one of only five Manhattan restaurants to hold The New York Times's coveted Four Stars as well as NYC's top food rating in the Zagat survey. The dining room recreates the cosmopolitan chic of an elegant 1930's Parisian rendez-vous - a sleek backdrop for Café Boulud's creative menu. Café Boulud offers a casual yet sophisticated ambiance, eclectic cuisine and, above all, a place where you feel welcome from the very start. No tie required! Since opening in October 1998 at the site of the former Restaurant DANIEL, Café Boulud's Chef Andrew Carmellini has been named a James Beard Foundation "Rising Star Chef of the Year" as well as a Food & Wine Magazine "Best New Chef". However, the Chef's greatest raves come from Upper East Side regulars who flock to Café Boulud's seasonal wine tasting dinners. A modern French-American bistro where the traditions of French cuisine meet the flavors of the American market with a menu reflecting the seasons and the simplicity of fine ingredients. DB is Daniel Boulud's interpretation of a new generation of Parisian bistros whose classically trained chefs offer creative cuisine in a casual, comfortable and contemporary setting. His New York rendition combines the youthful energy of his adopted city with the gallic flair of the country he left behind. Striking materials such as wenge wood carved furniture, metal bead curtains and red rubbed plaster walls are offset by the warmth of amber colored glass, fabric-wrapped ceiling panels and olive toned velour upholstery. Located in midtown at the crossroads of fashion and theater, Daniel Boulud's latest restaurant promises dining that is as easy going and convivial as it is delicious. Feast & Fêtes offers exclusive catering by Restaurant Daniel. From intimate dinners to lavish galas, they provide Daniel's sumptuous cuisine combined with personalized service attending to every detail of your entertaining needs. Jean-Christophe Le Picart, Feast & Fêtes co-owner and managing partner, will be happy to bring his years of expertise and savoir faire to your catered events. For his private label Daniel Boulud selects caviar with only the most delectable taste, texture and color that come from sturgeon harvested at perfect maturity from the shores of the southern Caspian Sea. His Iranian Beluga, Golden Oscetra and Sevruga, prized for their delicate, flavor, are available in individual tins or elegant gift boxes. His smoked salmon begins with fresh Scottish "Label Rouge" quality cured with an all-natural brine and smoked in small batches with native Maine birch wood. The butter smooth smoked salmon is hand sliced and vacuum-sealed in 4 oz or 16 oz packages or whole sides. Available overnight by mail order. Distributed exclusively by Browne Trading, Portland, Maine. Chef Daniel Boulud is as passionate as he is particular about his cookware. Now after thirty years in the kitchen, he has poured his experience into creating Daniel Boulud Kitchen. The line of chef designed kitchenware includes "Infini" enameled cast iron cookware, stainless steel cookware, kitchen tools and professional quality "Ultime" knives, with other categories to follow. The DBK knives will be the first to arrive in late August 2003 and will be available at Bloomingdales, from the Chef's Catalog and on www.amazon.com.